So this morning I helped a friend of mine install some widgets and plug-ins and other such funtimes on her blog and while skipping around internet tutorials, I discovered that I could install a third-party commenting platform to my blog which would enable me to respond in-line to comments! (I know--I just revealed how behind I am in the blogging world. Don't judge me. And wordpressers and typepadders, don't you dare gloat.) I scoped out review after review and finally decided to try one called Disqus. So if you go to leave a comment today, you'll see that it's a little different now, and I hope that's okay. If you find it difficult to use, please let me know; I'm happy to switch back to blogger's basic commenting system if that's the majority preference. Oh! And if you post as a 'guest' (versus, say, using your facebook profile), don't be alarmed when it asks you for your email; the information isn't displayed. I know, because I tested the new system by personally posting a dozen different comments with a dozen different log-ins, just to see what they all looked like. Because I apparently have loads of time like that. She was really good. Even though she got a gutter ball. You didn't get my church in the picture (St. Cuthberts, just NW of the castle). I like the photo with the building. Can I be perfectly honest about the pics? My very humble opinion of course...I would like the bottom one more if the greenish hue of the top one was present. Does that make any sense??? Really?? That was your church?! 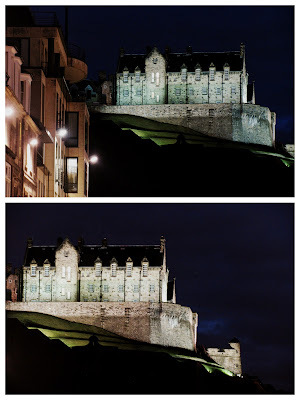 That's it: the object of my next Edinburgh photo session. commenting just for YOU! waiting and holding my breath until you reply. Wooo hoooo! I love it! Look at you, incorporating photos into your comment! I know exactly what you mean, and I think I agree that the hues on the top are prettier. Funny enough, that effect was naturally occurring and I didn't apply any color to it! Though perhaps now I should on the bottom. Wooo hooooo! Look at me go! I feel drunk with power and possibility. Burger time on atari was my favorite. I don't think we had a bowling game. 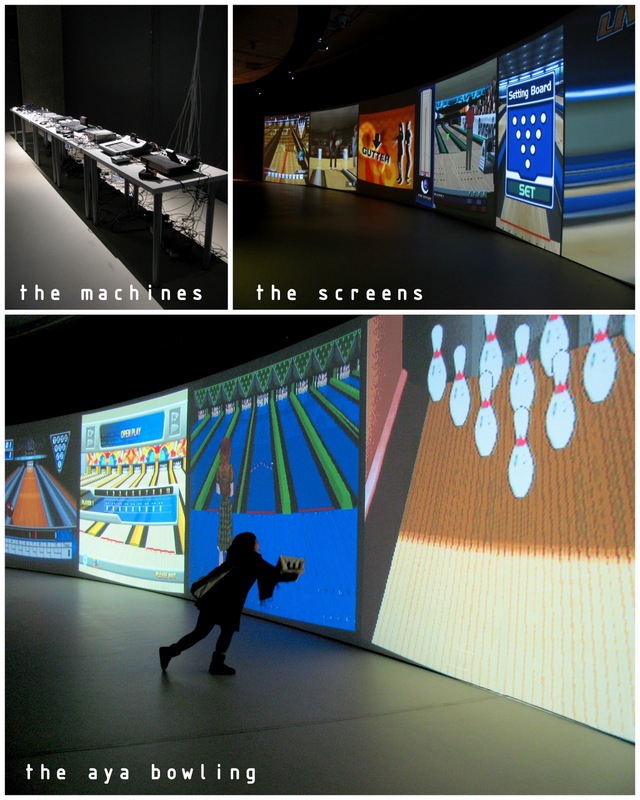 I've been to that bowling games exhibition too at the Barbican too! It took me back to the days when I used to play games like that on the Gameboy!!!! How pixelated the world used to be!!! Personally, I prefer the bottom picture of the castle alone...for some reason, I feel like the castle is staring out into the night to its right and keeping an eye out for invaders with its little companion (the smaller building in the bottom right)...but then I may have just watched too many bizarre animated movies that have caused me to develop an anthropomorphic view of the world!!! And yes, bizarre animated movies are the best! I like the new comments feature and photo #2! Well written post.I really appreciate your writing skills.Its great.You have done a good job by sharing this informative post with us.